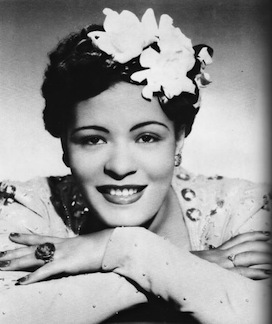 At some point after 1930, she began singing at a small club in Brooklyn, and in a year or so moved to Pods’ and Jerry’s, a Harlem club well known to jazz enthusiasts. In 1933, she was working in another Harlem club, Monette’s, where she was discovered by the producer and talent scout John Hammond. Hammond immediately arranged three recording sessions for her with Benny Goodman and found engagements for her in New York clubs. In 1935, he began recording her regularly, usually under the direction of Teddy Wilson, with studio bands that included many of the finest jazz musicians of the day. These recordings, made between 1935 and 1942, constitute a major body of jazz music; many include work by Lester Young, with whom Holiday had particular empathy. Though aimed mainly at the black jukebox audience, the recordings caught the attention of musicians throughout America and soon other singers were working in Holiday’s light, rhythmic manner.